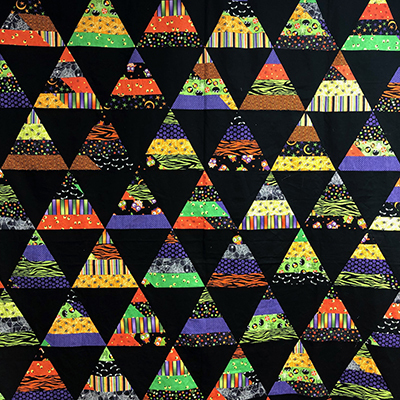 Do you have a Jelly Roll 1600 Race Quilt that you made and, let’s say, dislike greatly? Do you have one that you never had quilted? Well, if you would like to save your top from the pile of UFO’s, this class may be for you. Learn how to take a Jelly Roll Race quilt and make it into something fabulous by “cutting it up”! If you don’t have a race quilt, but you do have an old Jelly Roll that’s been sitting around waiting to be made into something fabulous, you can take this class too. You can use that Jelly Roll and some background fabric and make a beautiful quilt too! 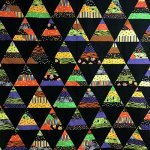 Note: Disclaimer - This is a technique class to learn how to use a 60 degree Equilateral Triangle Ruler to “cut up” your race quilt. You will not finish the quilt top in class.